Since we were young, & before the road to Corolla was open to the public we loved taking day drives to Corolla and four-wheeling on the wide open beaches & hiking back into the woods of Carova and watching the wild horses. We fell in love with the place then and are still in love with it. I can't explain how special Corolla is. Now with the new Wildlife Center and all the events held on the lawn of the Whalehead Club, it makes it even more special. You can stay at Sunkissed in Corolla and walk to the beach, movies, shopping, restaurants, and grocery store. Or, you might decide to ride bikes that are provided by our cottage.Take a five minute drive to the four wheel drive area and see the wild mustangs. Visit the historic Whalehead Club or just enjoy the Whalehead Grounds. It's easy to spend all day at Heritage Park. Pocket views of the beautiful Atlantic! The house was great. It had everything you need to enjoy a great week. Great swimming pool and hot tub. I love the beach chairs and the bicycles. The location was great, close to shopping and the beach. The owners are very nice and accomodating. Couldn't ask for a better vacation home. Fit all of our needs from A to Z! Couldn’t have been happier with this beautiful rental! House clean, well designed and stocked with everything you could imagine. Loved the pool and easy access to ocean, shopping and restaurants! I enjoyed dealing directly with the owner as well! Always available via email, text or phone. Clean, Large house, great location & plenty of room! We had a great stay! This house has FOUR amazing master suites- King beds and private bathrooms in each room, which was perfect for our large family (in addition to two other rooms for the kids). The house is very clean and modernly updated. The pictures do not do it justice! The kitchen was well stocked and the view from the top balcony was great for sunrises! Two FULL fridges was a great bonus. The owner is amazingly communicative and we appreciated her attention to detail and quick response time! 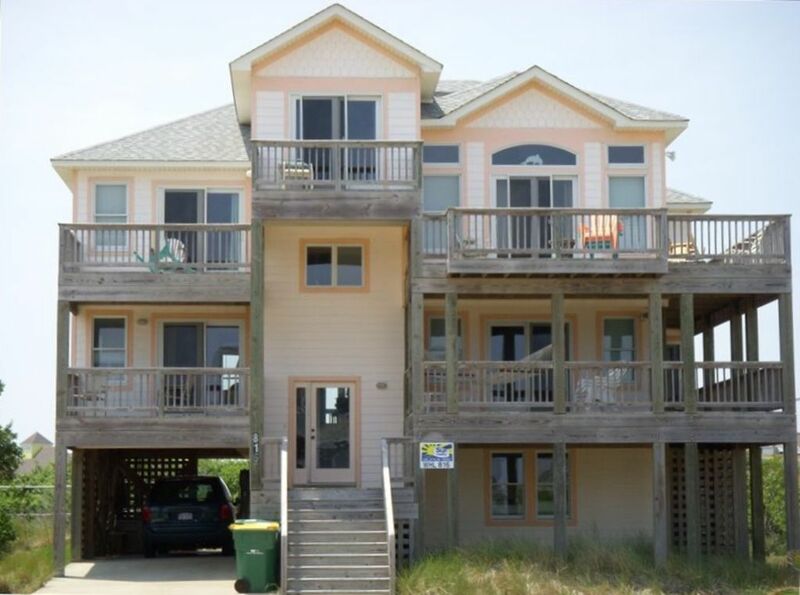 This was the best beach house we have stayed in yet in OBX! Super close the a shopping center with everything you could need and a very short walk to the beach! We had plenty of living space on the top level as well, with 6 young children and 8 adults. We had a great stay and would highly recommend and hope to stay again in future years! Thank you for a great visit! Very nice and accomodated all of us! This was a family vacation for 3 families, 14 of us total. Loved the house, the bedrooms each had their own bathroom except for one, which is a awesome feature. Lots to do at the house, appreciated all the beach items there were there to use, beach buggys, chairs, umbrella, bikes, totally enjoyed this house. We used the volleyball pit on the side of the pool and of course the pool and hot tub! We did have some rainy days, but we had plenty of space for all to keep busy!. Sharon, the owner was super and loved working with her! This was our first time staying here. It was perfect for our family. It is a beautiful house . Hope to stay here next year !. The owner was very helpful with all my questions. . We have vacationed in Corolla for many years and have never stayed at a house so great! We did not have great beach weather, but staying here made it a lot of fun, having the pool and hot tub for our family. All details have been considered, from the fully-equipped kitchen to the fun, beachy hand painted murals.More than the beach!More than you imagined! This home is ideally located. Golf at the renowned Currituck Club Golf Course. There are so many things to do: Tour the historic Whalehead Club and grounds and bring a blanket & attend a free outdoor concert on the Whalehead Club lawn during the season, tour the Corolla Light House and the Wildlife Museum. Sign up to attend free classes offered by the Wildlife Museum. OR visit the Wild Horse Museum and get info about the Wild horse in the area. Drive less than five miles and you are in the 4-wheel drive area where you might have a chance to spot a wild horse or two OR drive all the way to the Va/NC line via the beach. The tax rates are always subject to change by the NC General Assembly while in session. Any tax rates quoted will be adjusted according to NC Law. Rental Rates are subject to change and may vary from what is currently showing on this website. Call, email, or text owner for verification.